Maha Chandi Homam / Pooja | Sri Gayathri Ashram Inc. The purpose of the Chandi Homam is to remove any obstacles or blocks in growth both internally and externally for a person or a group of people. This is a major homam and one of the most prescribed ones for all round dosha removal and success in all undertakings, especially for victory over enemies and court cases. What Rudrabhishekam is for Shiva, Chandi Homam is for Devi. It is performed by Six Pundits. Elaborate Devi pooja is performed. Devi is worshiped in the form of Lakshmi, Saraswati and Chandi. 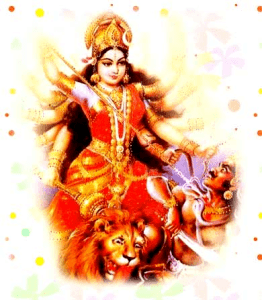 Durga Saptashati (Devi Mahatmyam) is recited fully and with each of the 700 slokas recital havan is performed and the Chandi mantra – Aim Hrim Klim Chamundaye Vichhe – is recited. After that Dampati pooja, Suhasini pooja, Kanya pooja and Brahmachari pooja are performed. It can also be done for a group of families together. The core of the homam ceremony involves a recitation of the Durga Saptashati or 700 verses in praise of the goddess Durga. With the recitation of each verse, offerings are made in the sacrificial fire invoking the goddess. The Durga Saptasati is 13-chapter narration from Markandeya Purana attributed to the rishi Markandeya. In a workbook-like, fascinating, allegoric way the verses demonstrate how the Goddess Chandi vanquishes and anihilates the two demons Shumbha (or Pride) and Nishumbha (or Shame), slaying the negativities of Indulgence and Denial, restoring the equilibrium necessary for perfection. By performing the Chandi homa, the sufferings that are caused by hostile elements are eradicated. The sufferings resulting from poison, sorcery, thieves etc. are removed by performing this homa. There is a popular Puranic saying kalau chandi vinayakau in this age of kali, only two Gods respond immediately to the prayers of devotees, they are Goddess Chandi and Lord Ganesha. The tantric texts Marichi Kalpa Vaarahi tantra and Chidambara rahasyam state the following as benefits of Chandi homa attainment of health, wealth, prosperity, longevity, food, wealth, progeny,fame, success, strength, removal of fear, ailments, danger, defeat in the hand of adversaries etc. By performing the homa five times, evil planetary influences are removed. The performance of this homa seven times removes all fears, performance eleven times begets royal influence and sixteen times begets progeny. The Homam to be performed depends on the type of problems & the individual’s Birth Chart, usually a Pundit is consulted for advice on the type of homams that are to be conducted. If you have any doubts please ask to our Pundits. A detailed analysis of your Horoscope chart, by our Pundits would suggest you the most suitable remedies or if to conduct special poojas for specific problems at specific temples, that would help you over come your problems and to obtain evident good results with the Power of Cosmic Energy. How Can I Get This Homam Performed? By analyzing your horoscope, our experienced Pundits can identify the reason for the problems and the ways to nullify the problems. Based on your Birth Chart and on the instructions given by our Pundit, selective Homams are performed by Our Experienced Priests. Our Priests has vast experience in the field of performing Homams & Poojas. They have sound knowledge on the various aspects of performing homams. The main aim of performing the Homams is to enrich positive energy of the ruling planets and to nullify the negative elements shown in the birth chart. It is also a form of remedial measure which has been followed from the ancient times. Homams and poojas performed for a particular deity by invoking Agni – the God of fire. It is said that when Lord Brahma (the creator among the Trinity) created man, he also created “Homam” for man’s livelihood and his attainment of spiritual desires. I am a christian and I don’t believe in Hindu religious practices. I have got a son who is doing his high school in a convent. He is . . .
My main ambition in life was to build a own house. I work in a company and with my salary I cannot build a house of my own. So I applied . . .